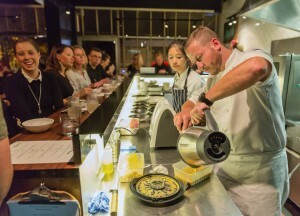 The very first Thermomix Restaurant Club event was held at Melbourne’s Huxtable in April 2015. It was so exciting to see concept become reality, in the form of a five-course Thermomix degustation cooked for restaurant guests. Chef Daniel Wilson created amazing food for appreciative Thermomix fans, including his In the Mix 2 dish: spiced tuna with yuzu curd and rice cracker. The twice-cooked duck leg with Sichuan chilli oil, pickled daikon, sesame salt and cashew butter was incredible, too.